If you think about Audi’s technological advances over the years, the A8 should spring to mind. Drivers are offered a refined driving experience in a truly beautiful car. It boasts a super sleek interior and stunning exterior finish, just like the German manufacturer is renowned for. The A8 is, perhaps, a little more aimed at the older person, but it still remains one of the best ways to drive about in supreme luxury. If you want respect on the road, the massive A8 will do that all day long. A second-hand A8 is a stylish and functional car. Four-way lumbar support is standard in all versions, as well as an electrically operated seat and steering column. Thanks to this, you can get a good driving position that’s comfortable for long journeys. Visibility is also good due to the broad windows and expansive rear screen. There’s a generous amount of leg and head room, and there’s a decent amount of storage space throughout the interior. If all this space isn’t enough, simply pop the rear seats down – which come as one rather than two. Audi put in pretty much every gadget they make, along with the best engines and build-quality. It is Audi’s flagship luxury model, so expect a bundle of wood, leather and comfort. This is no ordinary Audi. There’s a choice of two turbocharged V6 engines: a 3.0-litre petrol developing 335bhp and a 3.0-litre diesel with 282bhp. It’s a brilliant car, and one that anyone would be proud to own. Despite it being a relatively long and heavy car, a used Audi A8 handles reasonably well. Audi’s quattro four-wheel drive system comes as standard on all models and provides supreme all-weather traction, making it ideal for driving all year round. 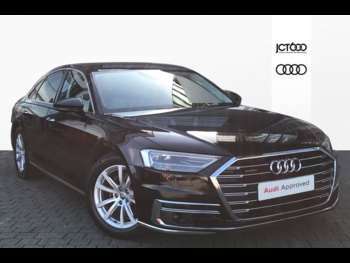 Got a specific Audi A8 model in mind? Got a specific town in mind?